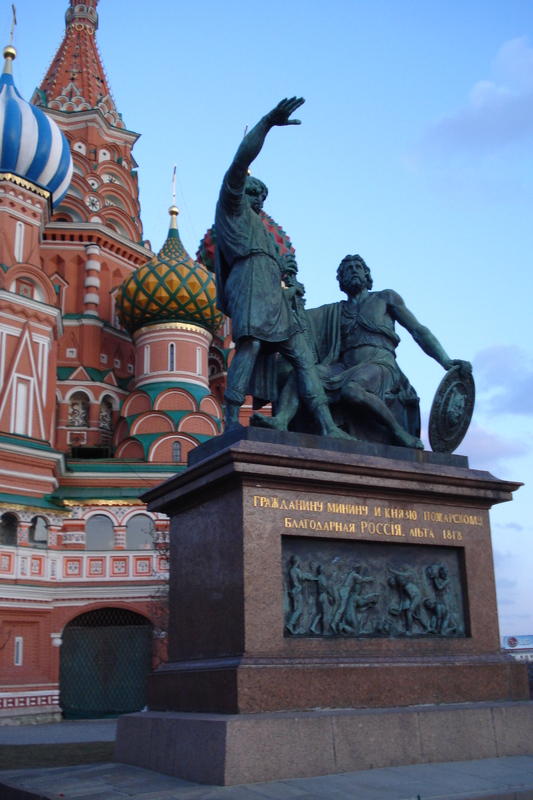 At the entry of Saint Basil’s Cathedral is the monument to Minin and Pozharsky, the two men who formed a volunteer army and marched to Moscow to free the Kremlin from the Polish interventionist forces. At one time the statue stood in the centre of Red Square but during the Stalin years was moved in order to convert Red Square into a giant military staging ground. Moscow Minin and Pozharsky monument by Alma Pater. 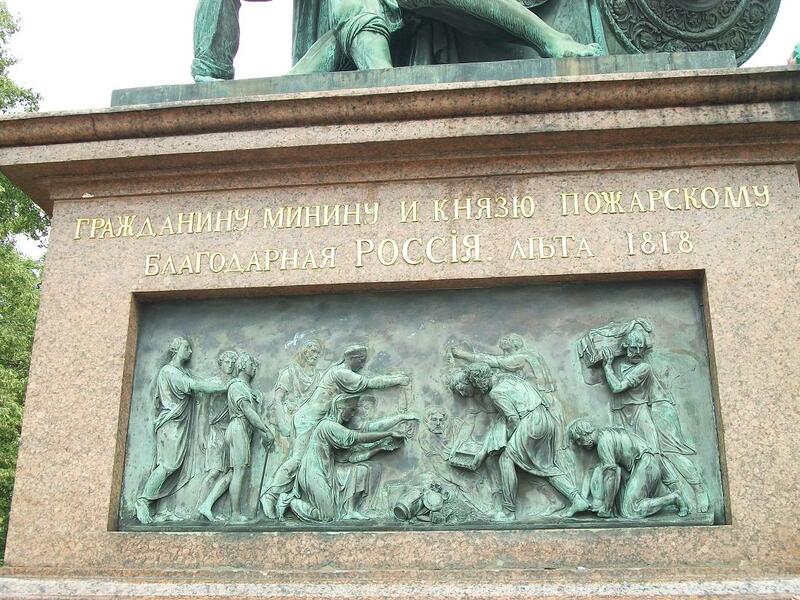 The prince Dmitry Pozharsky and merchant Kuzma Minin were the heroes of the 17th century war. 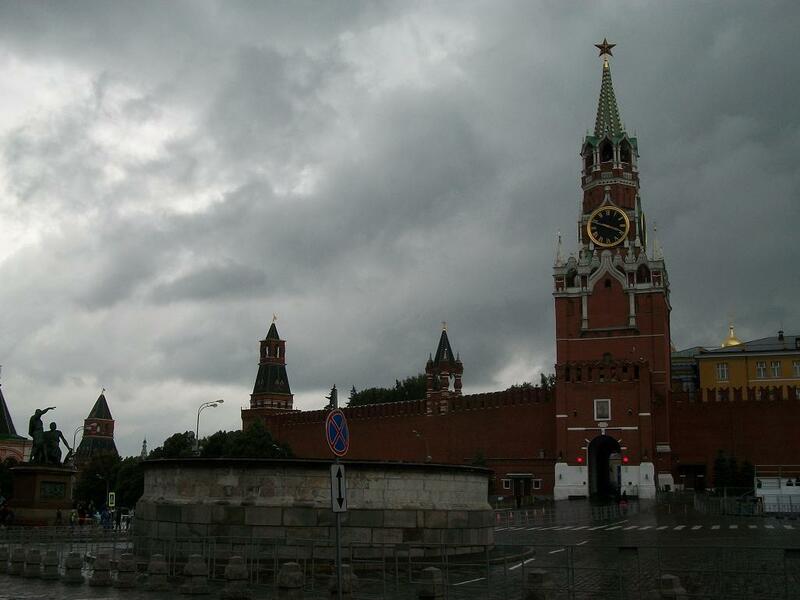 They gathered the all-Russian volunteer army and expelled the Poles from the Moscow Kremlin. There is an identical monument in the Russian City of Nizhny Novgorod, the home region of Minin and Pozharsky and many of the volunteer army. 04 November is National Unity Day. 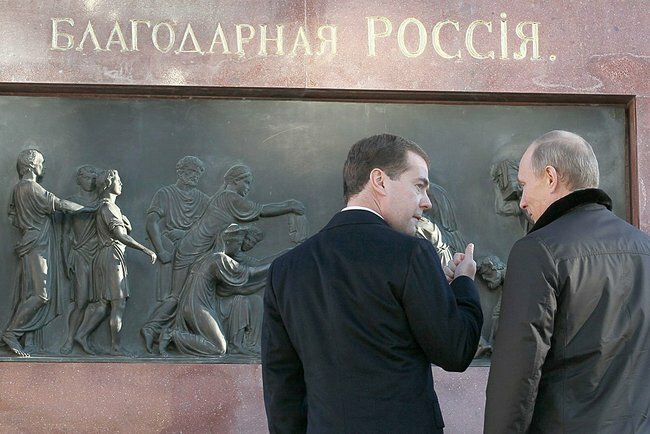 Medvedev and Putin visited the monument in Nizhny Novgorod. We show both monuments because it reveals an interesting change in the Russian language. In the spelling of Russia you see the letter i. This letter no longer exists in the Russian language as the Cyrillic letter i was phased out. Today the name Russia is spelled in the Cyrillic as Россия. I’d be disappointed too if having flown from far away to see the majestic plaza that is neither red nor square, only then to learn that most of it to be barricaded while a temporary stage with stadium seating was being erected. Still there is so much to see on “Beautiful Plaza” (the real name of what we call Red Square). Not many visitors see “Red Square” from this vantage as its not a common entry or angle. The Cathedral of the Intercession (we mistakenly term as “Saint Basil’s Cathedral) is unseen behind this angle. Lenin’s rotting corpse is to our unseen left and GUM (think ‘zoom’ when you say GUM) is to our right. The red building straight ahead is the State Historical Museum and you should definitely visit it! It is quite the impressive exhibit inside. To our left are 3 Kremlin towers–the smaller Senatskaya, then the larger Nikolskaya tower and at the corner is the Угловая Арсенальная башня (Corner Arsenal Tower). During the time of troubles and Polish intervention (1692), Duke Dmitry Pozharsky and Kuzma Minin burst through the gates of the Nikolskaya tower with their army of volunteers to liberate the Kremlin from the enemy. In 1812 Napoleon, ticked off that his arse was being booted out of Russia, attempted to destroy the tower and managed to damage a section including burning the roof. Despite his efforts, the tower stood firm. Napoleon was a real bungling idiot, vastly overrated in my view, as he also tried to dynamite “Saint Basil’s Cathedral” after being told by engineers that the intricately designed treasure could not be disassembled and taken back to France. Poor baby, he deserved his fate. Oh, speaking of bungling idiots, his engineers prepared the Cathedral for being dynamited and once the fuses were lit, a sudden rainstorm swept across the area and his plan fizzled. Here is a panoramic view, taken from inside “Saint Basil’s” looking back at Beautiful Plaza/Red Square with GUM on the right. The green statue at our immediate front is of Pozharsky and Minin, the men who led the volunteer army against the Polish army. 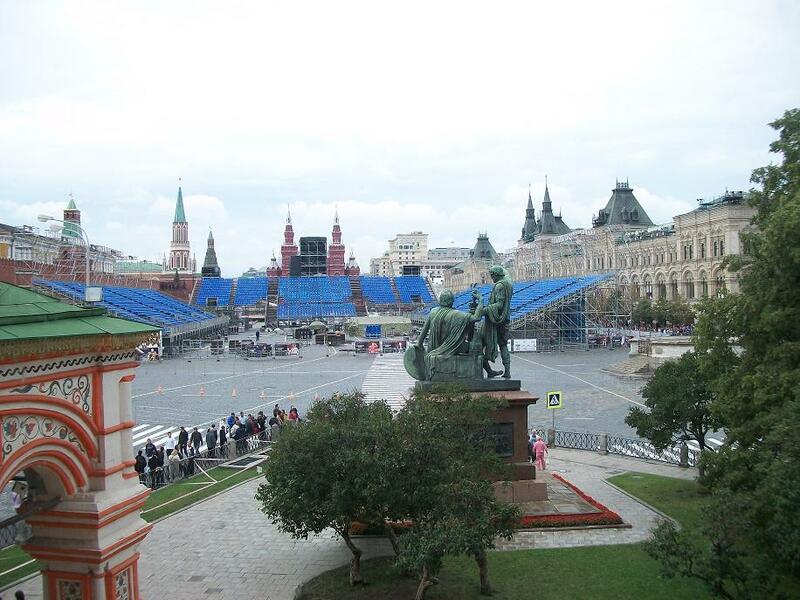 The statue for years stood near the centre of Red Square, in front of GUM, but was moved to this location to clear Beautiful Plaza/Red Square for Stalin’s military parades. The good news is that along the bulk of Beautiful Plaza/Red Square, there is so much to see at this magnificent “centre” of Russia! Photographed in mid afternoon, one can see that darkness comes early to Russia in the waning days of autumn. From this vantage point, standing on Red Square, the unseen St Basil’s Cathedral is to the left left. This is the most famous of the 20 Kremlin towers, the Спасская башня (Spasskaya or “Savior Tower”) with the 4 synchronized clocks, one on each side. Built in 1491–perhaps you can see the icon of the Saviour below the clock just above the archway. The Communists took the icon down but it has been restored. The small left tower: Tsarskaya (Tsar’s) tower built first just as a platform so Ivan the Terrible could watch executions on Red Square. Later the platform was made into the smallest of the towers in 1690. It is also the “newest” of the Kremlin towers. That big round stone (white/gray) circular raised platform just in front of us is the Lobnoye Mesto (Place of Skulls) on which public executions were carried out in the days of the Tsars according to some historians. Others historians however say that it was a place for public announcements, but not for executions. Really good site, now I feel like visiting Russia again…well I’ve been there back in early 90’s. Awesome, it is a great place to visit.